Contracts for new home sales disappointed in September, after a strong August and a run of weak job numbers. According to estimates from the Census Bureau, the monthly pace of new home sales declined 11.5% from August, falling from a 529,000 seasonally adjusted annual rate to 468,000. The September sales rate was effectively unchanged from the rate recorded in June. September’s sales decline appears to be due to demand-side weakness, perhaps related to recent lackluster economic activity at the start of the Fall. For example, total job creation for August and September was only 136,000 and 142,000 for each month respectively. 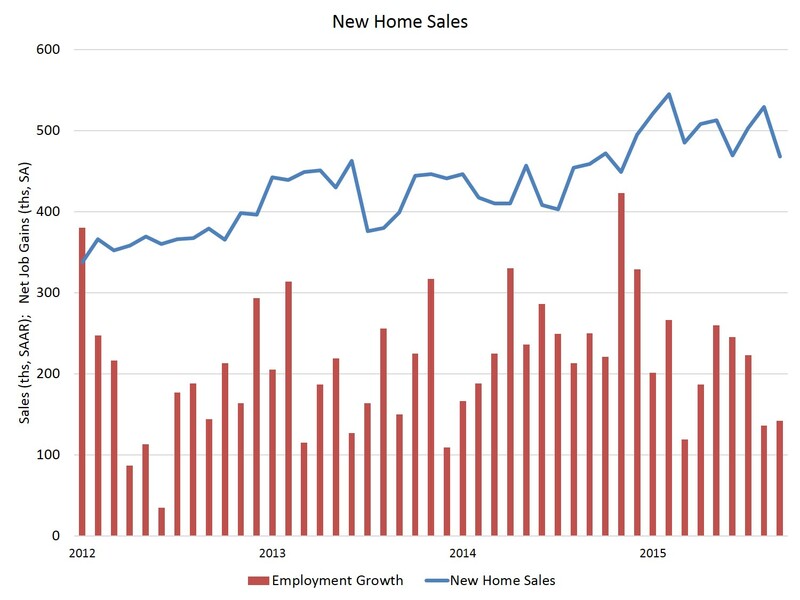 However, as a sign of the overall trend for the new home sales market this year, sales-to-date for September totaled 392,000 for 2015 compared to 333,000 for 2014, a 17.6% improvement. Given strong levels of builder confidence, we expect future months’ data to show a return to this positive growth trend. New home inventory rose in September, increasing 4.2% to 225,000 home for sales. This marks a 5.8 months’ supply, up from 4.9 in August. Of the total inventory, only 51,000 are completed, ready-to-occupy homes. Regionally, the monthly pace of home sales posted a large decline (61.8%) in the Northeast, after a strong month in August. There were broad-based declines in all other regions, including 8.3% for the Midwest, 8.7% for the South, and 6.7% for the West. The median sales price of new homes in September was $296,000. For more details on sources of new home sales financing for the third quarter, see the following post. I do not believe the new home market will return to anything close to the pre-downturn market until first-time buyer participation is restored to the traditional mark of approximately 40% from the current 29%, a decline of over 25% in the largest market segment. Those builders who are unconcerned about the first time market segment should consider that while they may not sell to first time buyers, a good many of their customers do. The first time buyer is key to both the existing and new home sales market.